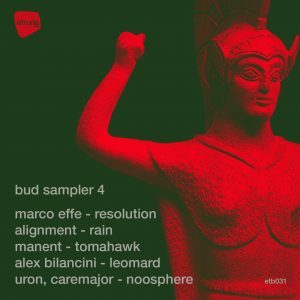 MARCO EFFE, ALIGNMENT, MANENT, ALEX BILANCINI, URON, CAREMAJOR. Summer is back and it is time for a new and fourth Bud Sampler. Our annual compilation sees the return of some good friends of the label alongside new faces. It all starts with the return of Marco Effe – after his successful remix of Reform – it was time to welcome the talented Italian artist back with some original material. ‘Resolution’ is your perfect techno tool : strong drums articulated around an hypnotic saturated 808 tom that gives the pulse through the whole tune . New comer Alignment is up next with a more melodic but still very straight tune . The synths of ‘Rain’ are shuffled in a way that will make the crowd jump. Manent comes next with ‘Tomahawk’. A broken kick and repetitive chord are all the ingredients needed for the perfect Etruria sound. Alex Bilancini offers us ‘Leomard’, a classic techno number in a pure Detroit vain. Influence of Hood and Dixon can be heard. Finally Uron and Caremajor’s ‘Noosphere’ presen ts a more subtle sound, dreamy with soothing synthesizers running on 808 based loops. Once again our Bud Sampler will make you dance, dream and delight in the music. Adam Beyer, Alan Fitzpatrick, Ambivalent, Sam Paganini, Carlo Lio, Gregor Tresher, Kaiserdisco, James Zabiela, ANNA, Karotte, Andre Kronert, Pan-Pot, Sasha Carassi, Victor Calderone, Wigbert and many more.